I have mixed feelings about Alaskan Alliance. Don’t get me wrong – I enjoyed the story (I always enjoy Kathi Daley’s stories); I just feel a little mixed about the plot line of this twelfth Zoe Donovan mystery. 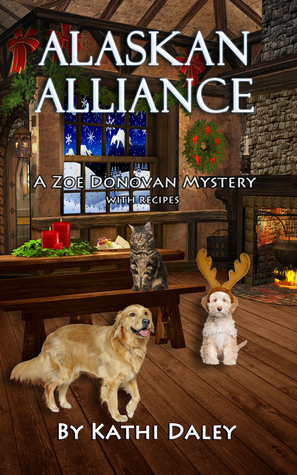 In Alaskan Alliance, Zak and Zoe head for a small town in Alaska in order to delver Sitka, a search and rescue team dog. Levi and Ellie had intended to come along for the trip, but a car accident left them both pretty banged up and unable to travel. Zoe’s loyalties are divided. She wants to stay and take care of her best friends, but she also knows that the search and rescue team up in Moosehead, Alaska, are depending on her to bring Sitka. Ultimately, Zoe and Zak head north, but Zoe can’t let go of the mystery of who ran Levi and Ellie off the road. Unfortunately for her, she also bumps into another mystery in Alaska after finding the dead body of a guest at the inn where she and Zak are staying. One thing I really did like about Alaskan Alliance is the interweaving of plot threads from previous books and the dangling plot threads that promise continued investigation in upcoming books. I always know I’m in for a fun read when it’s a Kathi Daley and Zoe Donovan book and Alaskan Alliance didn’t disappoint. And now it’s your turn! See below for giveaway information and how to enter and then come back and let me know what you thought about the story! Enter using this Rafflecopter link to win either a paperback OR a Kindle copy of Alaskan Alliance by Kathi Daley. Contest runs December 26 – 29. US winner can select either prize. Non-US winner will receive a Kindle copy.